I purchased this little dresser at the consignment shop for $5.99 last week. I planned to fix it up for my daughter. 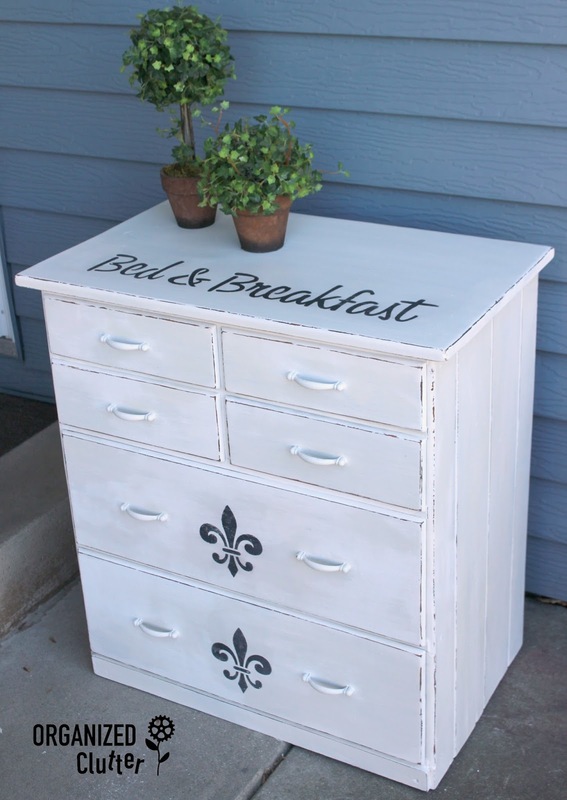 First, I painted it with two coats of Dutch Boy Chalky Finish Paint in "Popcorn" that I found at Menard's. I really like the product, and I really love the price of $18.99 a quart. Since I used chalk paint on the dresser, I didn't have to pre-sand or prime. 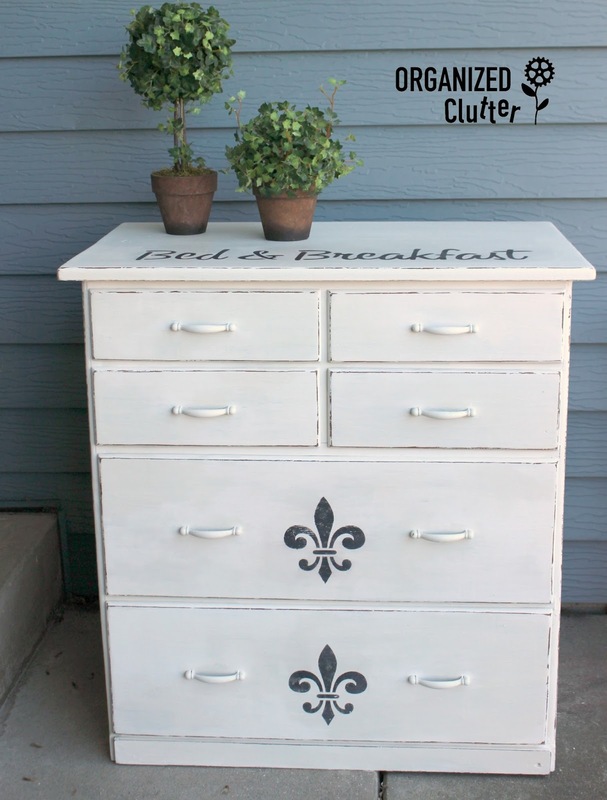 I then stenciled two of the drawers with a fleur d'lis stencil from Show Offs, purchased at Hobby Lobby, with black craft paint. I then used a stencil "Bed and Breakfast" from *Old Sign Stencils Getaway Collection on the dresser top. After stenciling, I sanded the edges with 150 grit sandpaper and I sanded the stencils a bit as well. Instead of waxing the little dresser I brushed and wiped on a coat of Miss Mustard Seed Hemp oil. This is the first piece of furniture I used the hemp oil on, but I had liked the ease of application and the nice finish on other small projects. 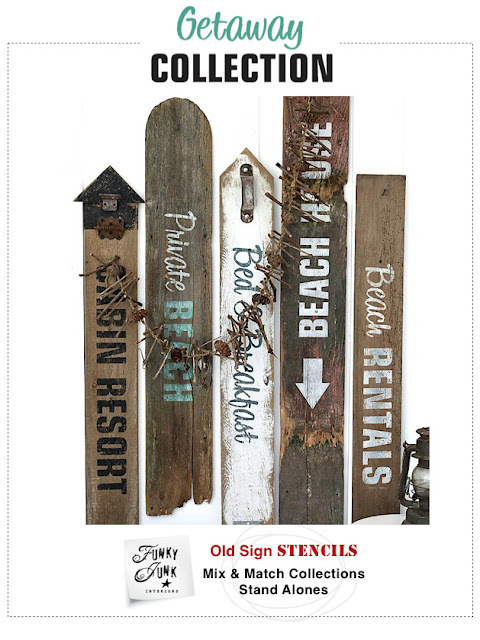 I receive stencils from Old Sign Stencils at a reduced rate, but am very happy to endorse the whole stencil collection. I am actually having a love affair with stenciling! I added the fleur d'lis stencil to match a scarf hanger that I had made for my daughter at Christmas time out of an old thrift shop plaque, and Hobby Lobby hooks. Wow! 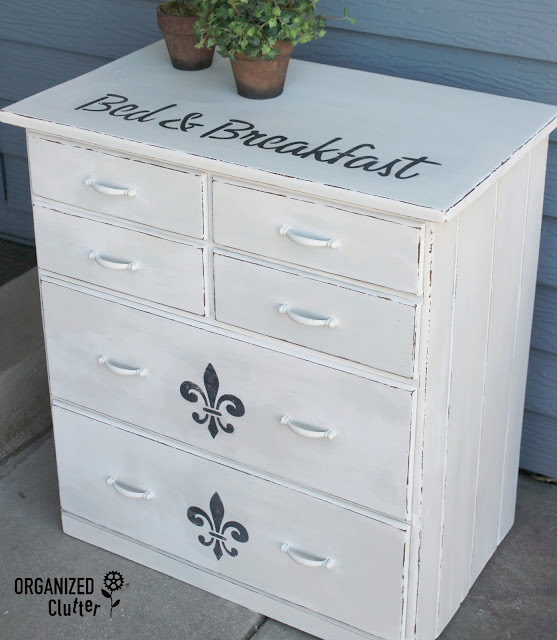 That dresser is great. My favorite so far.